We recently celebrated Ava's first birthday. Since we will be visiting Larry's family during the holidays, Ava will be having two birthday parties this year. Here are some pictures from birthday party number one. Prior to the party kicking off, Ava didn't really understand what was in store. 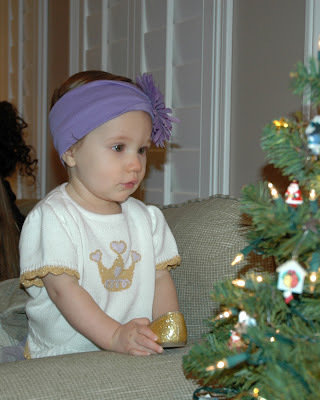 She just stared longingly at her Christmas tree (a new favorite pastime of hers) while the rest of us conversed. Ava's interest in her birthday party piqued once it came time to open her presents. She received a lot of really nice gifts from everyone, but the Fisher-Price Stride-to-Ride Lion appeared to be her favorite. 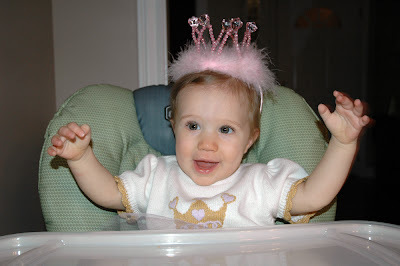 After opening the presents, we put her in her highchair and placed a special birthday tiara on her head. 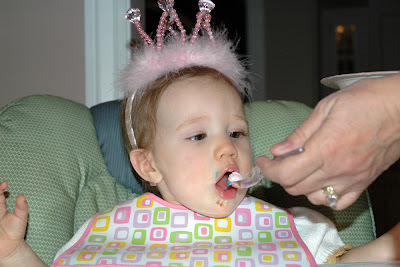 She didn't care much for wearing the tiara, but she understood what sitting in the highchair signified. Since Ava has become such a big advocate for fairies as of late, Krista decided that a Tinkerbell themed party was in order. There were really fabulous decorations, but sadly I (Larry) did not think to take any pictures of them. 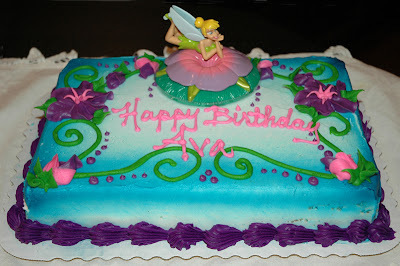 I did, however, get a picture of the birthday cake (only because Krista kept reminding me to). Ava quite enjoyed eating her birthday cake (we think this may have been her favorite part of the day). And Granny O was of course more than happy to oblige Ava's sweet tooth (she only has one, literally). Very cute pictures and video!! Looks like a fun party!! Although...WHY is she not eating the cake alone?!?! That would've made it even better!!! We're saving that for party number two, which is conveniently not being hosted in our house. Why get birthday cake all over your kitchen floor and walls when the grandparents are willing to get it all over theirs? She is adorable! Her birthday party was so much fun! Thanks for inviting us, we had a wonderful time!